January takes her parting bow today. After a respite that melted most of the snow and foolishly tempted both plant and birds into thinking spring was soon to be, I awoke to a once again cold, white winter. Curious, too, my start to this year as it’s taken the month to imagine and begin to see glimmers of the returning light. Right now, I’m in the third, middle week of the U.Lab: Transforming Business, Society, Self, a MOOC (massive open online classes) hosted by MIT, featuring Otto Scharmer and his team. Together with 25,000 people from over 190 countries around the world, we’re participating in a novel, highly experiential process to “learn how to create profound innovation in a time of disruptive change by leading from the emerging future,” by introducing the consciousness – that quality of awareness and attention – as the variable affecting the quality of the results we create in any social system. I’ve written about Theory U before, described other times when I’ve journeyed down the U, shared how I knew in my heart and bones the quintessence of this work when I first heard Otto present his ideas in 2003 at Shambhala-Alia – even before he called it “Theory U. “ Last year several of us held a study of this course’s featured book, Leading from the Emerging Future, and twice now, I’ve co-hosted a 2-day learning lab, Leading in Emergence, designed as an abbreviated journey though the U. So given this “more than passing” familiarity, I was bowled over when last week, for the first time I actually heard that the emerging future needs me, needs us, to be born and to have life. While perhaps pretty obvious to many, I was deeply moved by this. It’s not that I’m a passive, or even active participant. I am, we are, midwife to that future that comes from Self, or Source, or God, or pure creativity, whatever you call the embodiment and enactment of love. I just realized above that I wrote, “I’m in the middle of the U.Lab,” a perfect description for where I really am, both literally in the course, and metaphorically in my life – at the bottom of the U. Work has been slow to start this year, and at the moment, I don’t see much on the horizon for the next few months. Perhaps for one of the first times, I’m not too anxious about this. I spend many dark dawn morning hours sitting with my Peggy dog, imagining we’re both filling up on each other before she takes her parting bow. I remind myself, this is where I need to be now. Every time a vacation bargain crosses my screen, my Magpie-Crow-Raven cousins get seduced by the “shiny,” but by day’s end I delete what I know down deep is only a distraction. I remind myself, this is where I need to be now. I feel the uncertainty, unfamiliarity and void with letting go of a life-long honed identity that once served well…with cancelling long held dreams that no longer matter …with releasing relationships that use me up. I remind myself, this is where I need to be now. This year, The Scientist officially became a senior, and I celebrate a new decade, and face the reality that yes, while only a number, 60 is NOT the new 50; that I, he, we are entering into new and unfamiliar territory that we know will be marked by more letting go. I remind myself, this is where I am right now. I see how my Peggy dog has become the symbol for all that is letting go, dying, as was so starkly, heartbreakingly, blessedly revealed to me in a dream last week, a dream that when I recall, resounds deep in my gut. So now I have time to ponder and play with something a dear friend wrote in response to my blog wherein I wrote about having been struck with Bell’s Palsy, an illness that cracked me open, whose effects continue to reverberate, and is, I now know, one of the boons from the threshold I crossed when I took leave from work and traveled to Europe in 2010-11. “I went along for the ride (in a virtual world) when you went to Europe and I smiled and laughed and remembered my own trip many years ago. I wondered if maybe I was becoming stagnant as I don’t go too far these days and seem to be so very comfortable just being in my home. Then it occurred to me that what better way to live your truth than by getting up everyday and simply living your life? Not as a teacher or mentor or guide, but just living each day with the spontaneity that comes with a brand new day. Perhaps this is the future that is asking to be born through me now. For now, letting come winter’s pause to attend. 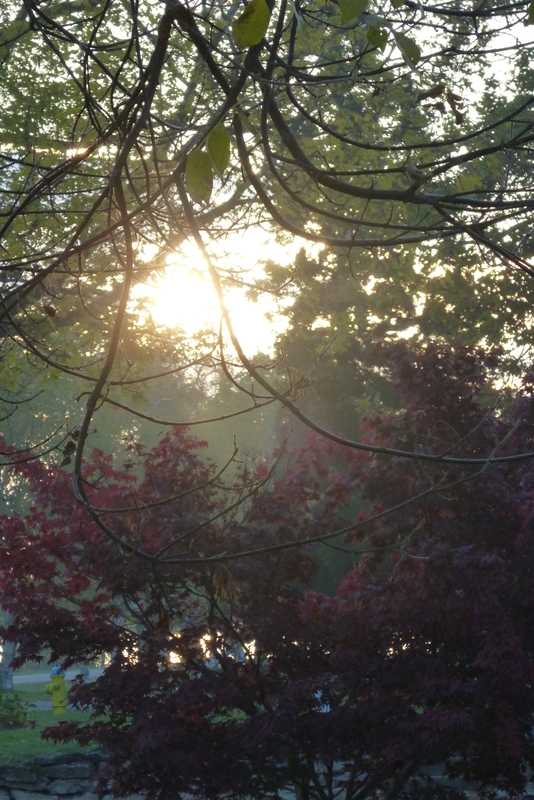 Coffee in hand, I settle into the corner of my “sanctuary’s” sofa, the best spot for witnessing the dawning of a new morning, this, the last Sunday of summer. Poised on the equinox, a soft golden glow appears through the willows as the sun makes its way into the sky, only two hours late, yet still early with what’s to come. Surprising the degree to which wind currents vary in the relatively small space of a backyard. From the barely evident whisperings among the lowest leaves and draped branches, to a fluttering higher up, and then to the more pronounced swaying in the treetops. Yet nothing like the big winds on Friday night, that came in a sudden and furious rush out of nowhere, stirring up big energies that caused a full moon-like fitful sleep, blowing out summer. The tapping of toes on hardwood floors and kitchen tiles as my dear old Peggy dog wanders, out of sorts that I’ve taken my place in a room she’s never really felt at home in – except for her mid-morning sun baths – now restlessly waiting to fulfill her role as my office assistant, where she sleeps by my desk and the space heater. Annie, meticulously cleans each toe on each paw, softly lapping and licking, focused and intent, until the need to establish ground, and hold court by issuing a low warning growl to Peggy’s unsteady and clumsy advances. Tender indigo lobelia, still flush and iridescent in its outdoor planter while fuschia geraniums and pale blue petunias look weary, having weathered early September cold and snow, and its rebounding heat and sun. 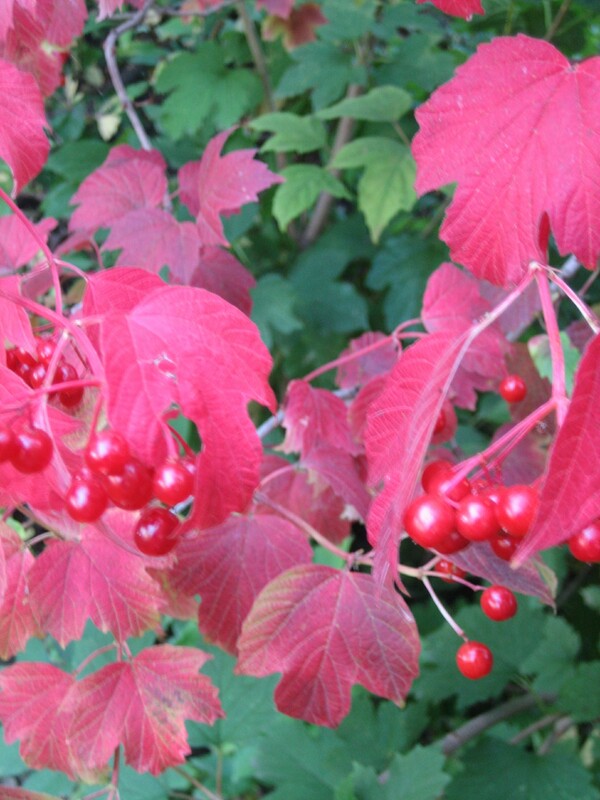 The high bush cranberry bushes filled with crimson fruit, leaves finally the promised vermillion after being freed from the shade of the dying forty year old mayday tree. Context is everything. Quiet and steady thoughts send blessings and loving kindness to family and friends, one about to return from travelling abroad, others in the mountains, several healing from health crises or tending to ailing parents, many riding the waves of transition with grief, fresh or anticipated. Gratitude for this moment, and for everyone and everything that as brought me to this moment. And then those thoughts insidiously slip to the next moments’ myriad of things to do and I notice – whoops – how I just lost my balance, how that soft and subtle, open and receiving, peace and contentment – in a moment – becomes tight and closed, shallow and anxious. Gratitude for this moment, for this new day, the last Sunday of summer. Earlier this month I read that for teachers, August is one long Sunday night. You know…that anxious-apprehensive-excited-can’t get to sleep-what will tomorrow bring? potion of emotions and thoughts, that if you know what I mean, might mean we’re all in this one long Sunday night together. A week ago, during a quick weekend trip to Niagara, to celebrate my in-laws’ 65th wedding anniversary, dine with my family, and sip wine at our favourite vineyards, I could hardly believe it was mid August. The Banana Belt’s signature hot’n’humid weather had given way to cold winds, grey skies and rain. Seems our summers had reversed, as out here in Alberta, we’d been blessed with sun and heat for days on end. To sip my morning coffee sitting outside at dawn is usually unheard of. Dining al fresco three meals a day for almost two months, while not my full dream realized, has come half way. Back in Niagara, only the hardy ventured into their backyard pools this summer, as water temperatures barely warmed, given exceptional rains and cool nights. Now back home, dawn comes a good hour later. Dusk, too. Birds entrain, their occasional morning songs muted by traffic’s drumming now trebled in volume. Poplar, ash and elm leaves yellow and drop on sidewalks. Apple and emerald green flora is giving way to dusty sage and pale gold. Once vivid blossoms are now faded and weary. Not even Miracle Gro restores their glow. Wasps and hornets have made their annual August appearance, and an onslaught of kamikaze mosquitoes are hell bent on making up for lost time. Less chirping from squirrels as they fly among the tree limbs, their cheeks stuffed with spruce cones. Yesterday, morning temperatures plummeted to single digits and I felt and smelled fall. One week left before we head into summer’s last long weekend. This year, August ends on that one long Sunday night. And while Monday is a holiday for many, come Tuesday we all wake up to a new month, a new season, a new year, if you know what I mean.